Marriage, Maternity, miscarriages are amongst those major and sometimes unfortunate life events and challenges that women face in advancing their career. On top of it women still have to fight against gender and pay inequality and discrimination to break that glass ceiling. But how can they do that? How can women be more deliberate about the career choices that they make? How can they manage these life events and still be successful in their career. Are women deliberate about their career? What are some barriers to better career choices for women? How should women manage those barriers and still pursue their career? Are women more likely to experience family related career interruptions than men? Why do women really quit their job? Can continued education help women advance in their career? How can Companies unlock the full potential of Women at work? Sairee is interested in working with women navigating careers and work life choices. She is the CEO of Applied Life Pvt Ltd. Founder @SHEROESIndia. Horizon Gazer, Fleximoms. 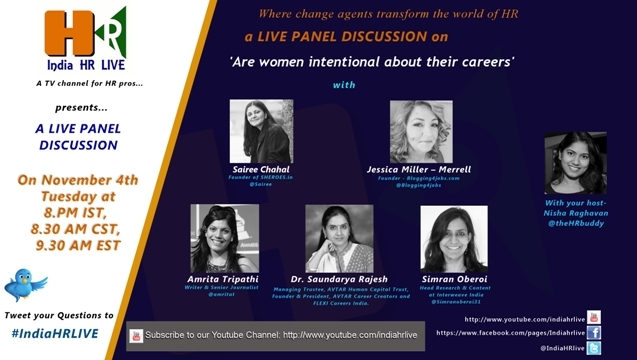 Women@Work,TED Speaker, Cartier Alumni, Convener, Check out SHEROES.in a career destination for women. For women making high growth, conscious choices of career path. Amriat Tripathi is a writer and senior journalist, based in New Delhi. A news anchor and broadcast journalist for 9 years with CNN-IBN, she is now freelancing and working as a consultant. She tweets @amritat. Founder & President, AVTAR Career Creators and FLEXI Careers India. Dr. Saundarya Rajesh, one of the earliest voices to speak on Gender Diversity & Inclusion of Women in the workplace in India. She was awarded the NEST Entrepreneur of the Year award for 2013. She was awarded the Naturals Extraordinary Woman Award 2014 in recognition of the work she has done in creating opportunities for Indian women. Mother of 2 and wife to a busy professional, Saundarya identified with the thousands of Indian women who had to give up their careers mid-way in response to a work-life balancing need. Via the social enterprise which she leads, FLEXI Careers India and the AVTAR Human Capital Trust, Saundarya works with over 35,000 women managers who are part of the AVTAR I-WIN network – Interim Women manager’s Interface Network. AVTAR I-WIN’s vision is to engage with the larger population of over 1.5 million Indian women who have dropped off the career track over the past 2 decades and who can be the real answer to India’s talent/skill shortage. She has represented India in many conferences around the globe, speaking about Flexibility and flexible working as a panacea to the low representation of women in the workplace. After her work at UK and US as part of consulate-led missions for gender diversity and women’s workforce participation, Saundarya has been instrumental in cutting-edge work done by AVTAR in the space of creating flexi-careers. HR Research and Advisory expertise of over 11 years in areas such as Rewards, Job Mapping, Diversity & Inclusion, Capacity Building, Talent & Leadership Development, HR & Social Media and so on, for India and Asia Pacific, with firms such as Hewitt Associates, PricewaterhouseCoopers, Hay Group and SHRM India. Headed the Knowledge Development and Research in SHRM India, for 12 HR disciplines, for thought leadership pieces and was the Asia Pacific Sector Leader for Rewards (followed by the Middle East Africa + Indian subcontinent Sector Leader) at Hay Group. Published over 30 articles, perspectives and papers on various HR Disciplines in leading journals and blogs such as Wall Street Journal Blog, People Matters, ISTD’s quarterly journal, Human Capital, Business Manager, Business Standard, the SHRM website, Economic Times. Hindu Business Line and so on . Recently completed a 12-article series on Diversity at the Workplace. Working on a new series of 12 articles on Rewards & Recognition. Currently working as an Independent consultant on different projects, one of the key ones being to head Research & Content for Interweave India , a pioneering diversity management company.